Client code and the browser user events / layout / rendering / painting all happen in turns in a single thread. When your code runs for too long, user's interaction is blocked. When your code takes too long the user cannot even scroll! Angular is my framework of choice right now, and its slowest part is often the digest cycle. During the digest cycle, the angular engine looks at every object attached to its scopes to see if anything has changed since the last cycle. If anything has changed, things happen: model data is updated with new values, which in turn updates the DOM, etc. Under the hood, every scope has watchers - functions that return values that the engine can check against previous ones. This is called dirty checking and can be quite slow if there are lots of objects to compare. It can also be slow if listener functions that run on data changes take long to finish. 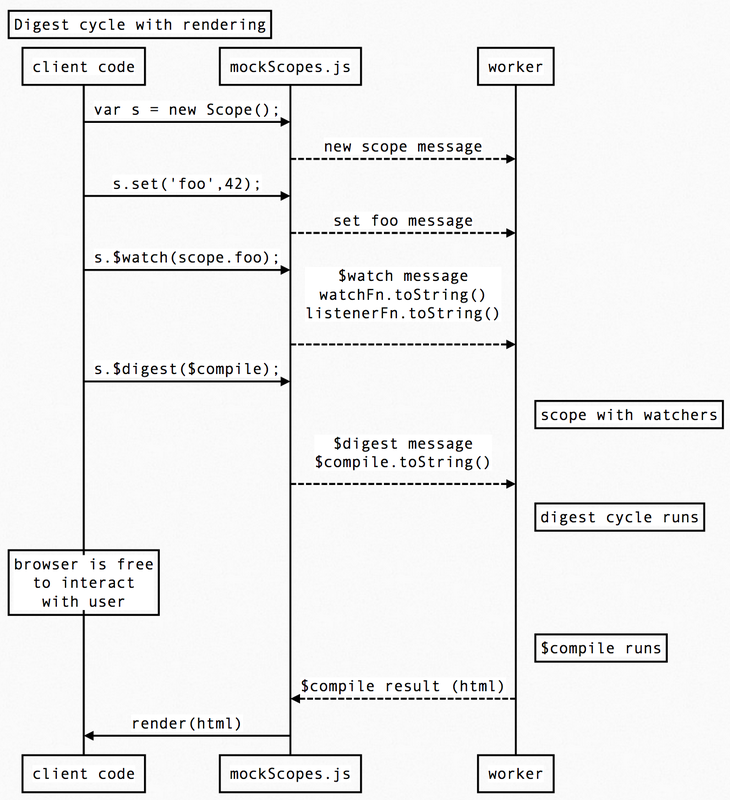 Implement a micro angular feature set with just scopes, watchers and digest cycle. Use the micro angular implementation to compute lots of prime numbers to slow down the digest cycle. The entire application can be moved to the web worker, but this completely changes the application's nature. I will move scopes, watcher functions and digest cycle, leaving Angular-like application in the main context. Bonus 2: I will propose using virtual DOM to speed up browser updates. Each step will be described in enough detail to follow, but you can always grab the example repo and try it for yourself. Let us create a micro AngularJs library that can keep track of scopes and implements dirty checking. Then we will speed things up by moving the digest cycle and dirty checking into separate thread. I created a sample git repo bahmutov/digest-cycle-in-web-worker that you can clone and run locally. Different steps are tagged step-1, step-2, etc. We can implement the digest cycle ourselves in a few lines of code. I grabbed code for a single digest cycle from the excellent Make Your Own AngularJs. Let us introduce code to significantly slow down the digest cycle. We can slow down the watcher function or the listener function. If we slow down the watcher function, we will slow down EVERY digest cycle, even if nothing has changed. This is often the reasoning for using fewer and simpler watchers in your application. If we slow down the listener function instead, then it will only affect the application if something has changed. I will slow down the listener function by finding first N primes if the user set scope.n. The implementation is slow on purpose, and finding even a couple of thousand primes takes seconds. Let us add render the found primes. For now, we can just form HTML markup and stick it into DOM after the digest cycle finishes. We can separate rendering by passing a callback into the $digest function that will only be called if the model is dirty. 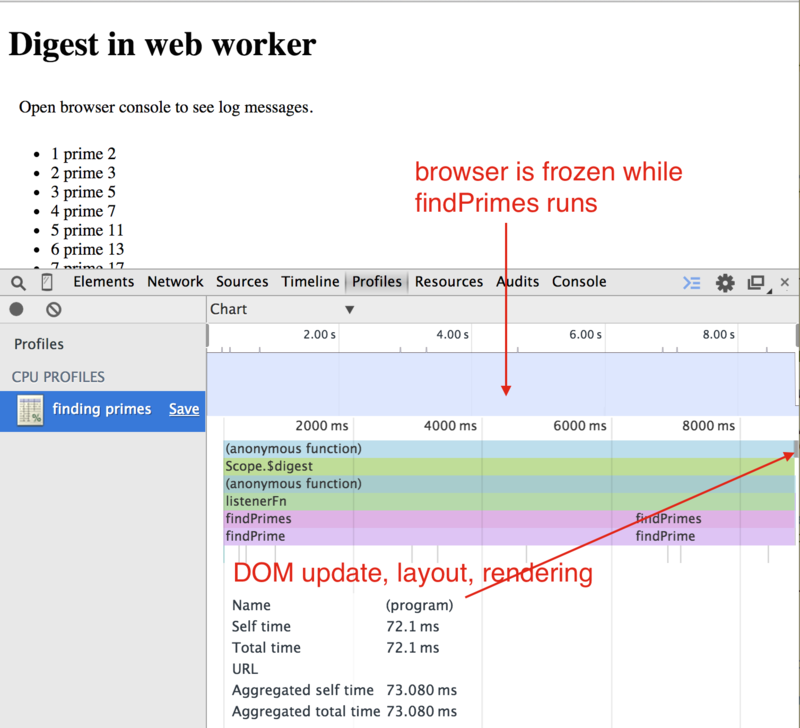 To better understand the performance of our code, let us profile the digest cycle and DOM update using Chrome DevTools CPU profiler. We will start the profile before the digest cycle and will finish the profile after the browser updates the DOM nodes and repaints. We will achieve this by setting a timeout call after setting the HTML markup. browser schedules DOM update, layout, rendering, painting to be run after current event queue is empty. stopProfile goes to the end of the event queue, behind DOM update, layout, etc. You can see in the red rectangle around the browser layout, rendering and painting steps. The code is at tag step-3. Let us kick off another browser thread and move our micro angular implementation (and prime computation) from the main browser thread to the web worker. The main thread and the web worker can communicate via messages. The browser behavior is much nicer when the computation is offloaded to the web worker. The user can interact with the page while the code runs. This also mimics the desktop GUI libraries where the drawing / events thread is separate from the application's thread. Yet, I look at the code and cannot recognize it. It is no longer an AngularJs application, my micro angular engine is only running in the worker, and the client code has no idea what is going on. I would like to write an Angular application and only run the digest cycle in the worker. I used js-sequence-diagrams to render the above picture. 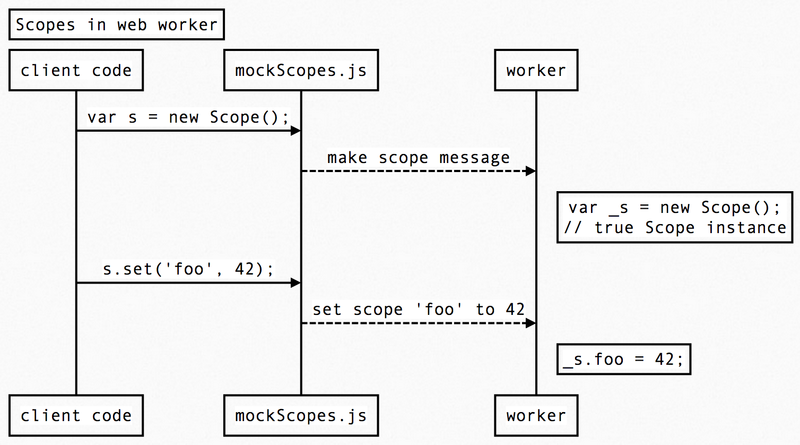 Our mock-scopes.js provides this Angular-like API to the client code, but it only sends messages to the web worker. Finally, our micro-angular-worker.js receives messages in the web worker and actually updates the scopes. You can find this code at step-5 tag. Our digest cycle depends on the user-defined watcher and listener functions. How do we add these functions from the client's context to the scopes that reside in the web worker? By serializing and shipping the function's code of course! The key point is that we serialize the function's code using .toString method and ship it across the web worker context boundary, where we recreate it using eval. // ReferenceError: watchFn will execute in web worker, not here! Instead, you should only use variables attached to the scope inside the watch and listener functions. Finally, let us move the digest cycle to the worker code. We also need to send the updated HTML markup string from the web worker back to the client code after the dirty digest cycle. Here is the client-side $digest mock. Again we are shipping a function to be called from main context to the web worker using toString method. Here is the worker $digest implementation. We are running micro-angular $digest cycle, and if there were any changes to the model (based on watchers), listeners will run, and then digestFinished evaluates the $compile function and posts a message that goes back to the client context, including the produced HTML string. Let us go back to our initial example: finding first 5000 primes. Now we can code the application using the same Angular-like approach (except for scope.set('n', 5000); nonsense). We can now capture the page's timeline, and try scrolling while the primes are being generated inside the digest cycle. Everything works. You can try the code at step-8. a feature already available in the Chrome browser. Our mock scopes code will just observe each created mock scope instance, and will send messages on any changes to the web worker. Hmm, why do we start the digest cycle before setting n property? Our Object.observe callback runs asynchronously by scheduling the changed callback onto the event loop. To fix the message order we need to change $digest to schedule the postMessage via event loop too. You can try the code at step-9 in the Chrome browser. When generating new HTML markup, we are just replacing the current innerHTML contents with new string. This is very inefficient, if the generated markup only differs a little from the current DOM. A better approach would be to generate a virtual dom tree in the web worker and ship only the difference back to the main context via postMessage. Then the DOM can be efficiently updated a patch function. postMessage(patches); // we can even release patches! I tried using just a diff and patch library diff-renderer, but it is crushing for any non-trivial markup (like a list with a few items). Update 1 For ng-conf I created simpler repo with just a few demo steps, see repo2. The slides presented at the conference are at bahmutov/run-digest-cycle-in-web-worker.